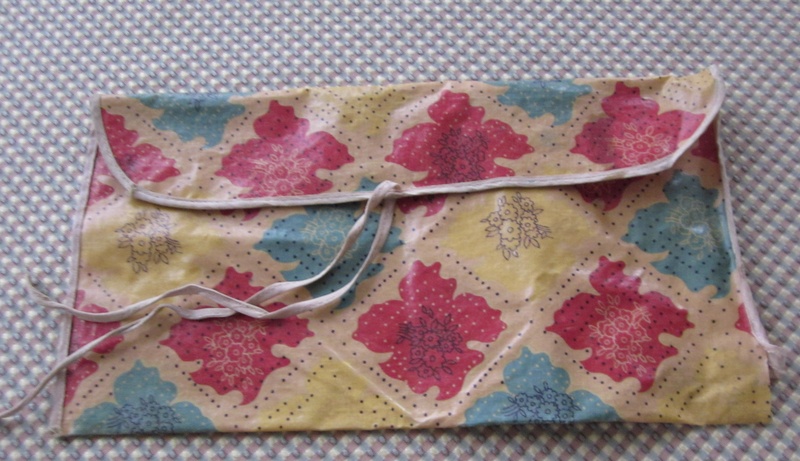 My first knitting bag – memories! Recently “stumbling” upon my first knitting bag – a gift from my great Auntie Kate when I was a young knitter – has made me think of two stories. One is about my Auntie Kate and an article that was published in the local news in March 2005…the other story takes me back to high school. I’ll share the stories in reverse order….high school in Stratton, Co…and then back to Auntie Kate in Geelong, Australia. I am sharing the high school story first….in memory of my friend Peggy who died one year ago today. She has been on mind all week and particularly today. During our senior year of high school when we weren’t with our “guys” Peg, Mary and I went almost every where together. Mary and I worked at the local drugstore after school…Peg worked on the farm. I didn’t take my knitting to school or to work…but I took it many other places. I am pretty sure that I was the only one who knit in our high school of 100 students…yes, that was 100! When we were seniors we went to a track meet in a neighboring town..60 miles away. I must have been the driver because I am the one who lost the keys to the car….it took much time to find them….they were in my knitting bag! It was Mary who said….look in your knitting bag. Now, I ask you….where else would you put your keys?? I recall that my friends didn’t find it as funny….but I do recall Peg laughing a lot then and in later years about this! I do miss that spontaneous sense of humor that Peg had. And now the “Auntie Kate” story that appeared in the news. “Carolyn Pugh has been involved in fibers and fiber arts since early childhood. She learned to knit on the playgrounds of an Australian school ground and continued on with formal studies of textiles and fibers throughout her high school and college days. Ask Carolyn about Auntie Kate and that question will immediately bring a smile to her face. Auntie Kate was her mother’s aunt. Carolyn and Auntie Kate first met when Carolyn’s family moved from Oakland to Geelong, Australia. Carolyn was 8 and Auntie Kate was 60 something. She had flowing white hair which was always captured into a bun at the nape of her neck during the day. For Carolyn the move to Australia was truly an adventure…..meeting her grandfather’s brothers and sisters, making new friends and learning the art of knitting. The family lived on Townsend Road, Whittington, Geelong for two and a half years. The home was set behind the cluster of the Pinder Clan: Uncle Chas and Auntie Kate, Uncle Frank and Aunt Madge and cousin Margaret; cousins – Merle and Charlie, and cousins – Dot and Frankie. It was during this time that Auntie Kate influenced her American niece in the arts. She loved children as she had none of her own, and Carolyn spent many hours with her learning to knit, darn, ball yarn from a skein to a ball. The knitting time together often included breakfast of poached eggs, tea, toast and sometimes, scones. The adventure of getting to Auntie Kate’s included a walk through the Pinder pastures and through Uncle Chas’s back yard of geese. This walk often found Carolyn knitting like shepherds of the past – the needles flying as she walked. In memory of Peg and Auntie Kate. Peg won a rowing medal! Not only does Peg knit beautiful garments, but she rows! And she has just won a medal. Many mornings at 5 am she can be found at Lake Merritt in Oakland with her rowing team. Go Peg! Peg belongs to our Tuesday evening knitting workshop. 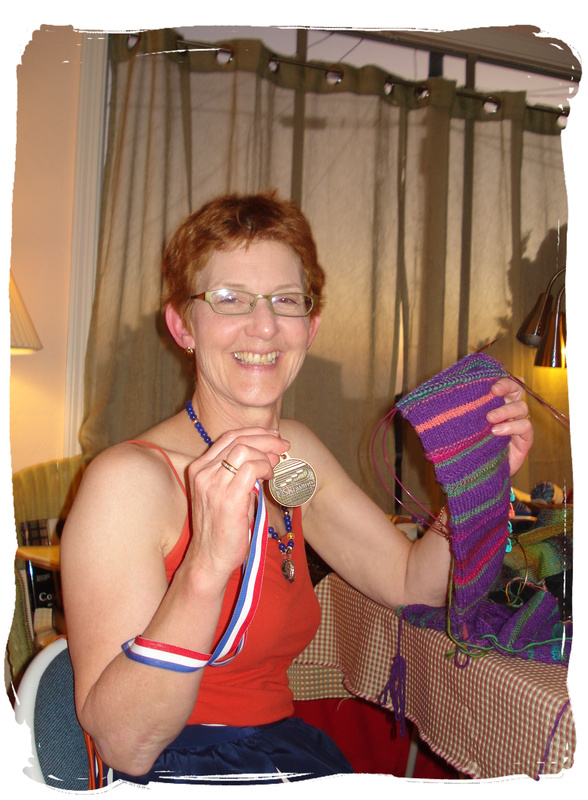 If you belong to Ravelry, you can find many of Peg’s garments posted. Peg and "Joseph's Blanket of Many Colors"
Peg had a lot fun knitting this blanket, another Log Cabin version from Mason-Dixon Knitting, as a baby gift. It’s great how she offset the lights and darks…and she was able to use a lot of yarns from her personal stash. Tomorrow I’ll share the one I did that was going to be for me…and then it became a gift for a life-long friend.